Richard Parkes Bonington (1802–1828), Grand Canal, the Rialto in the Distance - Sunrise (1828) (242), oil on canvas, 43 x 61 cm, Private collection. Wikimedia Commons. The first part of this two-article series on the short life of Richard Parkes Bonington (1802-1828) left him at the end of 1825, having established himself as a successful painter of watercolour landscapes, many of which were turned into prints, and of acclaimed oil paintings. I never tired of watching his marvellous grasp of effects and the facility of his execution; not that he was readily satisfied. On the contrary, he frequently redid completely finished passages which had appeared wonderful to us; but his talent was such that he instantly recovered with his brush new effects as charming as the first. Richard Parkes Bonington (1802-1828), Les Salinières near Trouville (1826) (144), watercolour over graphite, 11 x 21.5 cm, Getty Center, Los Angeles, CA. Wikimedia Commons. Bonington continued to paint coastal views. Noon argues that his Les Salinières near Trouville (1826) was painted from memory in the autumn of 1826, recalling the tour with Huet the previous year, and after Bonington’s return from Italy to his own studio in Paris. The repoussoir trees at the left are delightfully painterly. 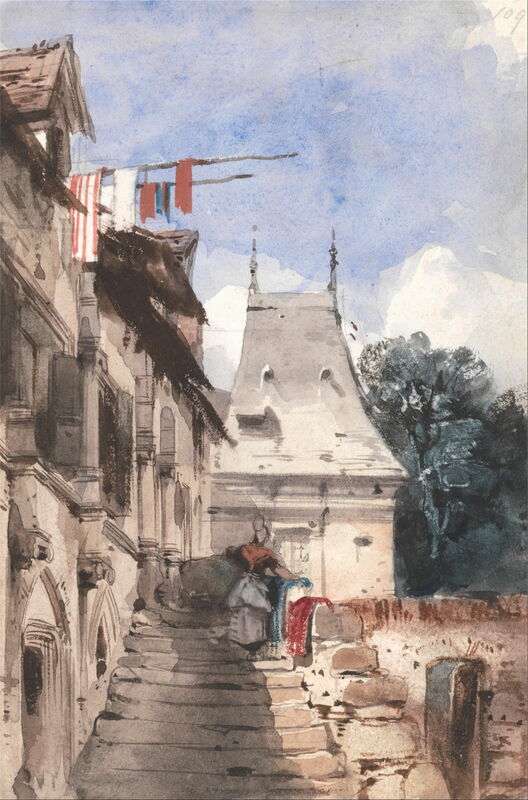 Richard Parkes Bonington (1802–1828), The Abbey St-Amand, Rouen (c 1827-8) (147), watercolour, bodycolour, gum arabic, and washing out over graphite on medium, cream, slightly textured wove paper, 19.2 x 12.6 cm, Yale Center for British Art, New Haven, CT. Wikimedia Commons. The Abbey St-Amand, Rouen (c 1827-8) is a rare late watercolour showing this dilapidated monastery near Rouen Cathedral. Noon suggests that Bonington may have painted it when he passed through Rouen on his way to London in 1827, or later from memory and sketches. From 1825, Bonington had also started painting figurative works of history painting in earnest. Although it would turn out that he had little time to develop in this genre, he demonstrated that he was as technically competent with figures as he was with nature. Richard Parkes Bonington (1802–1828), Portia and Bassanio (c 1826) (340), watercolour and bodycolour over graphite, 16.5 x 12.7 cm, Yale Center for British Art, New Haven, CT. Wikimedia Commons. 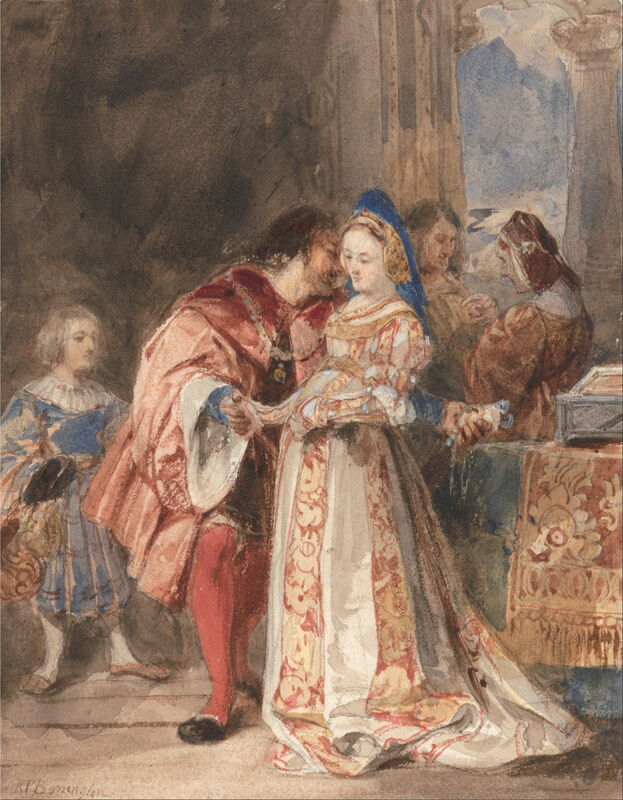 Noon reveals that Portia and Bassanio (c 1826) shows a scene from Shakespeare’s Merchant of Venice (Act 3, scene 2), in which Bassanio has come to Portia’s palace at Belmont, to win her hand in marriage. To do this, he must choose the correct casket out of three containing gold, silver, and lead, of which the last contained the winning portrait of Portia. Here Portia’s maid Nerissa stands aside, and Bassanio, recognising his successful choice, seals the betrothal contract with a kiss. Richard Parkes Bonington (1802–1828), The Use of Tears (1827) (380), watercolour, bodycolour, and gum arabic over graphite on thick smooth card, 23 x 18 cm, Yale Center for British Art, New Haven, CT. Wikimedia Commons. The sentimental melancholy of The Use of Tears (1827) is tragically appropriate if not prescient. 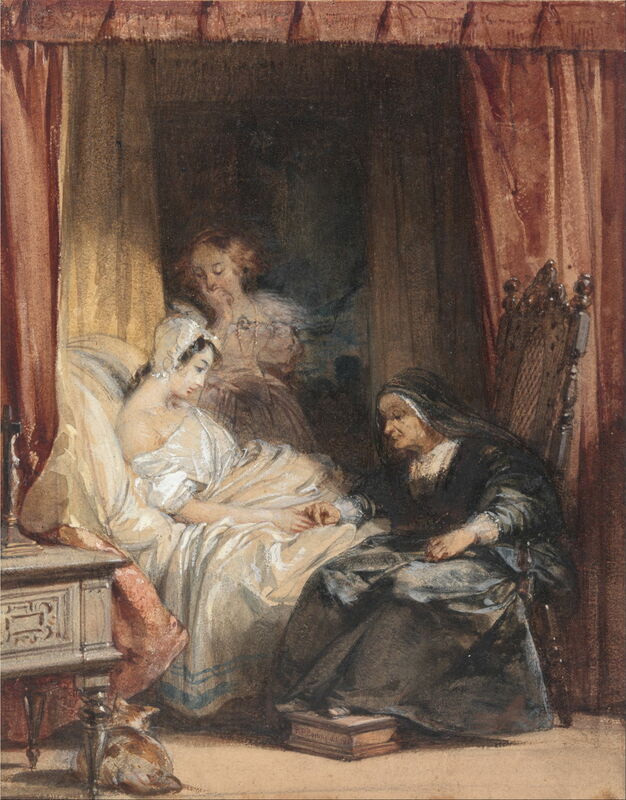 It shows a young woman in her sickbed, if not deathbed, a popular and commonly-experienced scene of the time. Richard Parkes Bonington (1802–1828), Knight and Page (Goetz von Berlichingen) (c 1826) (401), oil on canvas, 46.5 x 38 cm, Yale Center for British Art, New Haven, CT. Wikimedia Commons. It was Noon who proposed that this painting, Knight and Page (Goetz von Berlichingen) (c 1826), showed Goetz von Berlichingen from Goethe’s Sturm and Drang tragedy of that name. He was a German warlord who struggled irrationally to defend his feudal lifestyle in the face of modern reform. Bonington probably painted this when he was sharing Delacroix’s studio in early 1826, and left it incomplete with Delacroix when he moved out. In April 1826, Bonington left Paris with Charles Rivet and crossed the Alps via the Simplon Pass to Italy. After a few days rest in Milan, they pressed on to arrive in Venice later that month. 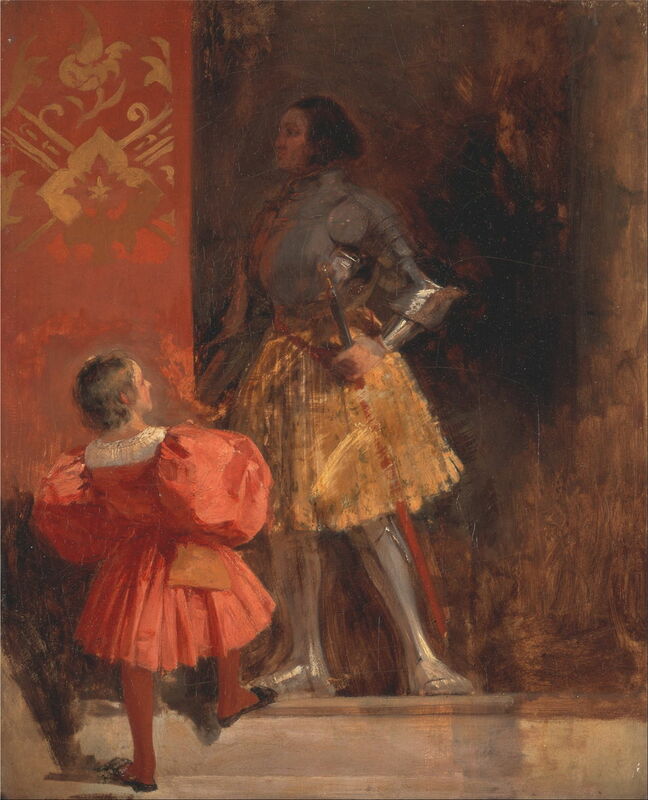 Once in Venice, Bonington produced a large number of sketches and studies, some watercolours painted in front of the motif, and a few oil sketches on millboard which were at least started en plein air. Richard Parkes Bonington (1802–1828), On the Grand Canal (1826) (240), oil on millboard, 23.5 x 34.8 cm, Yale Center for British Art, New Haven, CT. Wikimedia Commons. On the Grand Canal (1826) appears to be a brilliant plein air oil sketch painted from a boat, showing the entrance to the Grand Canal. 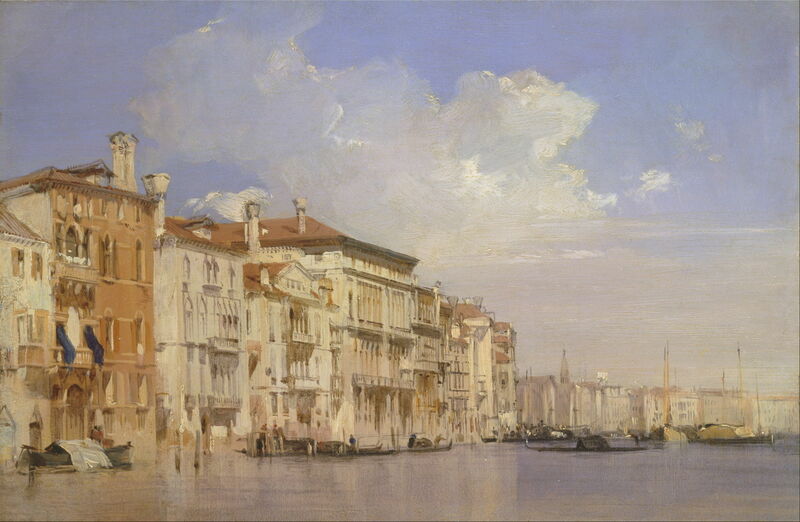 Bonington has removed one of the palazzi, but otherwise appears faithful to the motif. Richard Parkes Bonington (1802–1828), The Grand Canal Looking Toward the Rialto (1826) (244), oil on millboard, 35.2 x 45.4 cm, Kimbell Art Museum, Fort Worth, TX. Wikimedia Commons. 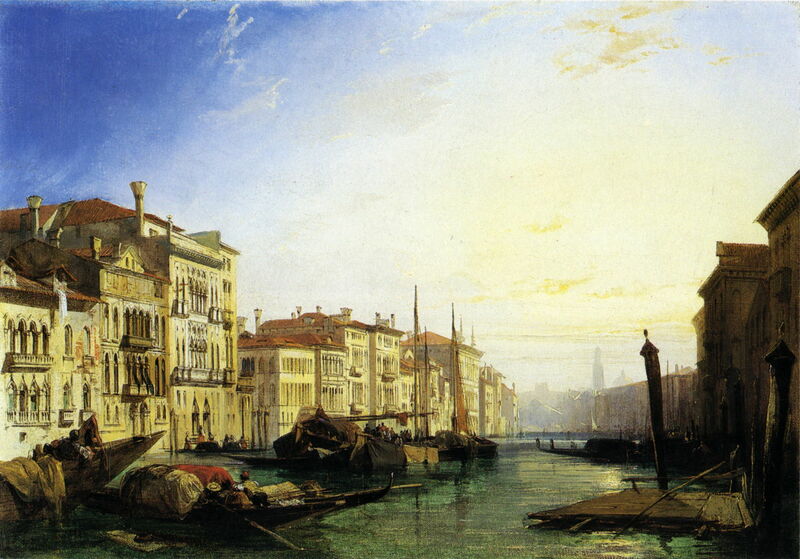 The Grand Canal Looking Toward the Rialto (1826), also on millboard, may have been started en plein air, but appears to have been completed later in the studio, when back in Paris, which may account for the difference in hues in the sky. 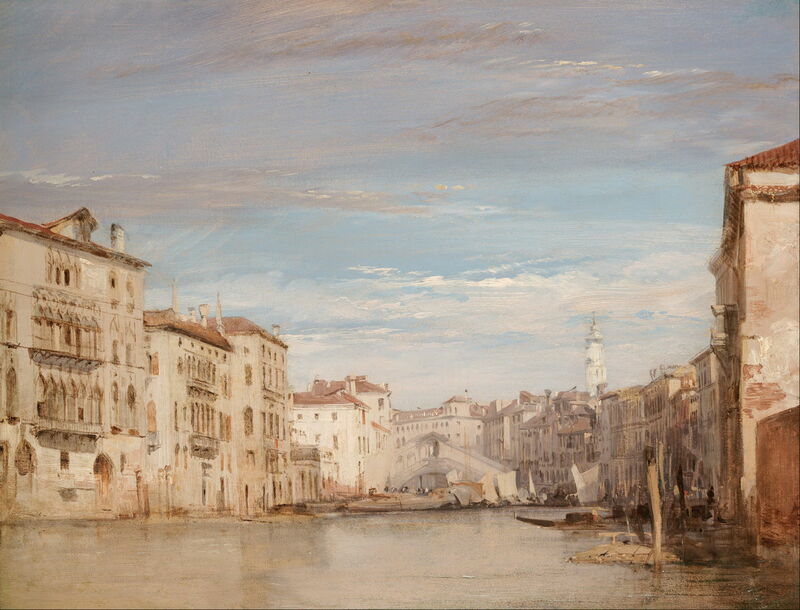 Bonington and Rivet left Venice on 18 May, visited Padua, Florence, and Pisa, and Bonington then returned alone via Switzerland in June. Once back in Paris, Bonington moved to his own studio, while remaining on very good terms with Delacroix, who considered that the visit to Italy had produced changes in Bonington’s style. In the late Spring and early summer of 1827, Bonington went to London to develop his links with the art trade there. The later months of the year were extremely busy for him, preparing for a much-delayed Salon and other exhibitions. He was again very successful at the Salon which was eventually held in two parts during November 1827 and from February 1828, at which Delacroix’s Death of Sardanapalus was first shown. Sadly Bonington’s paintings from the second part of the Salon, with a single exception, have either vanished or become badly damaged. Richard Parkes Bonington (1802–1828), Riva degli Schiavoni, from near S. Biagio (c 1827) (237), watercolour and bodycolour over graphite, 17.7 x 17 cm, Museum of Fine Arts, Boston, MA. Wikimedia Commons. Riva degli Schiavoni, from near S. Biagio (c 1827) shows the San Marco basin from the Arsenal traghetto. 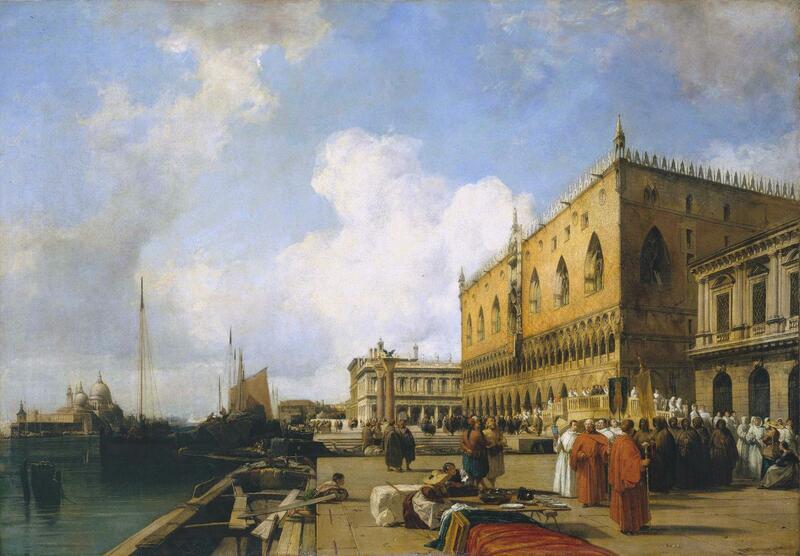 Although a small watercolour, Noon considers that it was painted well after Bonington’s return from Italy. 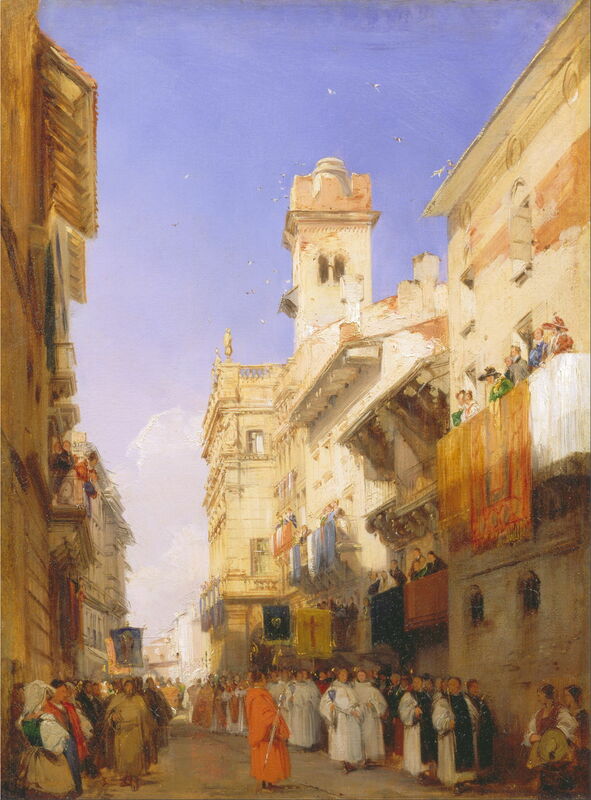 Ducal Palace with a Religious Procession (1827) was apparently painted in late 1827 for James Carpenter, from graphite studies which Bonington made during his visit in 1826. Painted on a white ground, it unfortunately underwent quite severe shrinkage, and was extensively retouched as a result. However, it was generally very well received at the time, despite the liberties taken with its representation of the view. 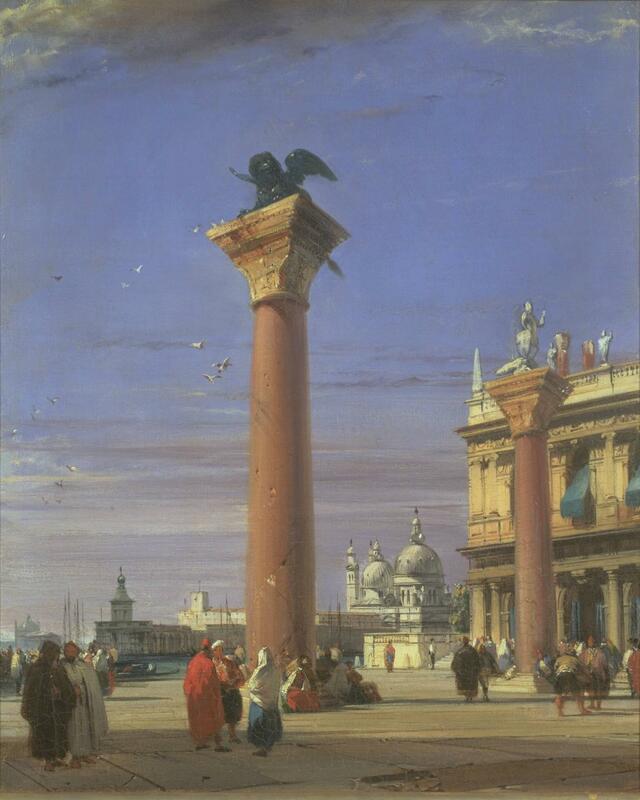 The Piazzetta, Venice (1827) shows the smaller Piazzetta which passes out from the Piazza San Marco. This too was painted in the studio from graphite sketches which he had made during his 1826 visit, and again takes various liberties with reality. 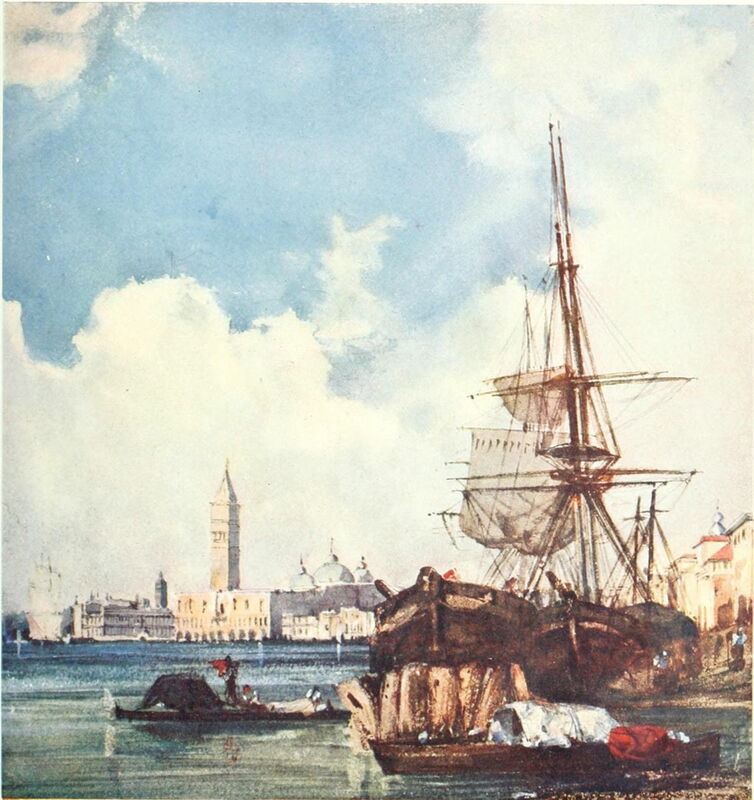 In February 1828, Bonington visited London again in time to see the two views of Venice above exhibited at the British Institution, then returned to Paris to recuperate from the hectic work of the winter, resuming various printmaking projects. In May he sent three oil paintings for the Royal Academy exhibition, encompassing his coastal views, Venice, and history. Richard Parkes Bonington (1802–1828), Grand Canal, the Rialto in the Distance – Sunrise (1828) (242), oil on canvas, 43 x 61 cm, Private collection. Wikimedia Commons. Grand Canal, the Rialto in the Distance – Sunrise (1828) is another of Bonington’s finest oil paintings, made in the studio from graphite and other sketches from 1826. This painting has quite commonly been described as showing sunset, but as the view faces almost due east, must have been set in the early morning. Bonington’s health was deteriorating during the early summer, and by the beginning of July he was physically incapacitated. He continued to sketch and paint from the back of cabs in Paris, but in September his parents had him moved to London for medical attention. He died there as a result of pulmonary tuberculosis – ‘King Death’ – on 23 September 1828, a month before he would have turned 26. Richard Parkes Bonington (1802–1828), Corso Sant’Anastasia, Verona (1828) (221), oil on millboard set into panel, 60 x 44.2 cm, Yale Center for British Art, New Haven, CT. Wikimedia Commons. 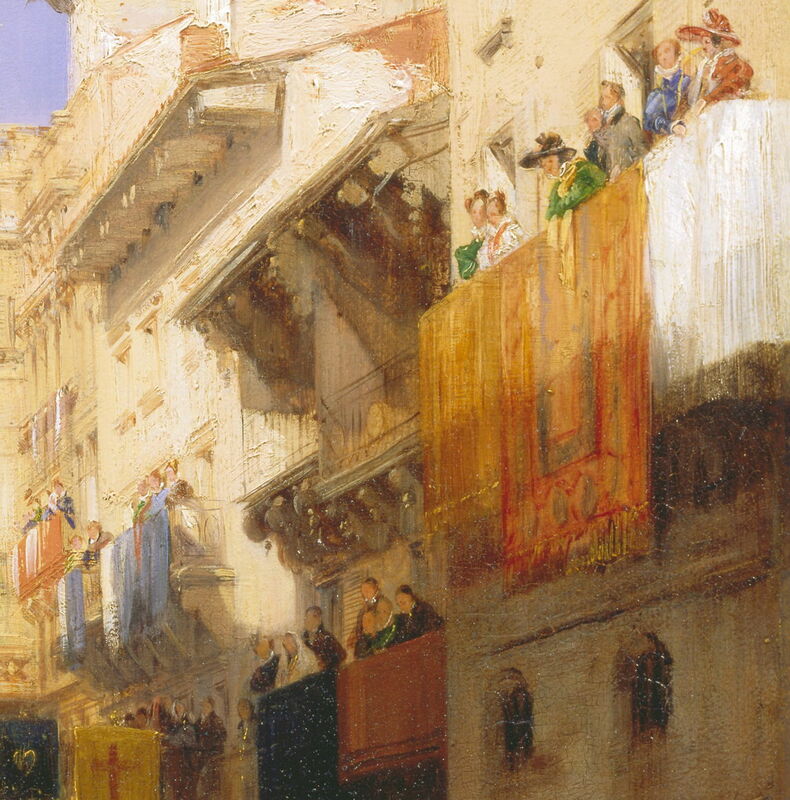 Richard Parkes Bonington (1802–1828), Corso Sant’Anastasia, Verona (detail) (1828) (221), oil on millboard set into panel, 60 x 44.2 cm, Yale Center for British Art, New Haven, CT. Wikimedia Commons. Here are some example oil paintings from other prominent artists of the same period as Bonington. 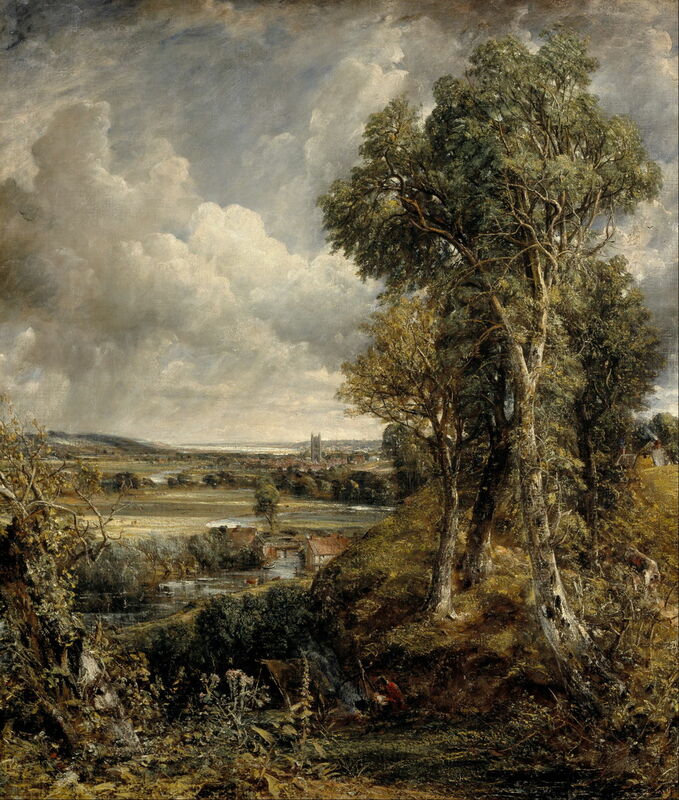 John Constable (1776–1837), The Vale of Dedham (1828), oil on canvas, 122 x 144.5 cm, Scottish National Gallery, Edinburgh. Wikimedia Commons. Although Constable’s sketches and studies were very loose and progressive, his finished paintings were much more traditional in style. 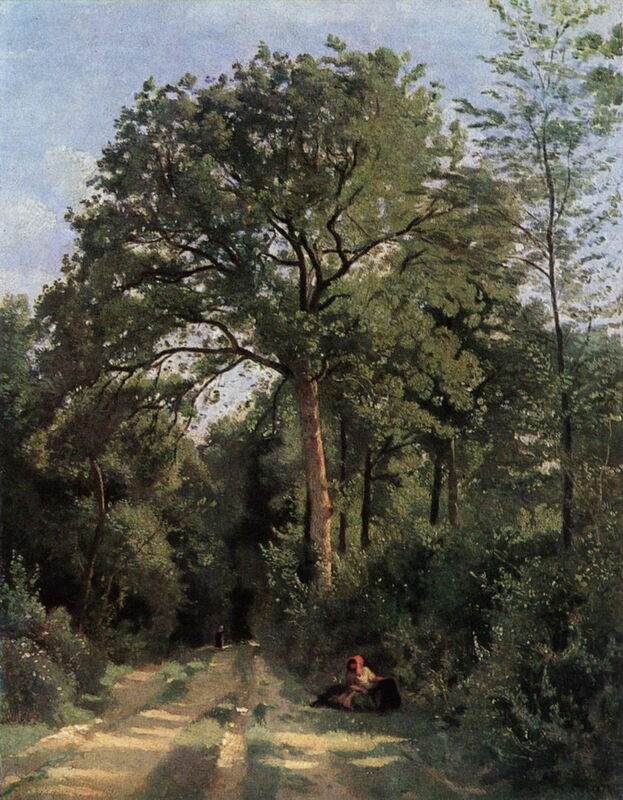 Jean-Baptiste-Camille Corot (1796–1875), Ville-d’Avray: Entrance to the Wood (c 1825), oil on canvas, 46 x 35 cm, Scottish National Gallery, Edinburgh. Wikimedia Commons. At this time, Corot, who was six years older than Bonington, was starting his plein air campaign in the Roman Campagna. His Ville-d’Avray: Entrance to the Wood (c 1825) makes an interesting comparison with Bonington’s A Wooded Lane (c 1825) shown in the first part of this series and repeated below. 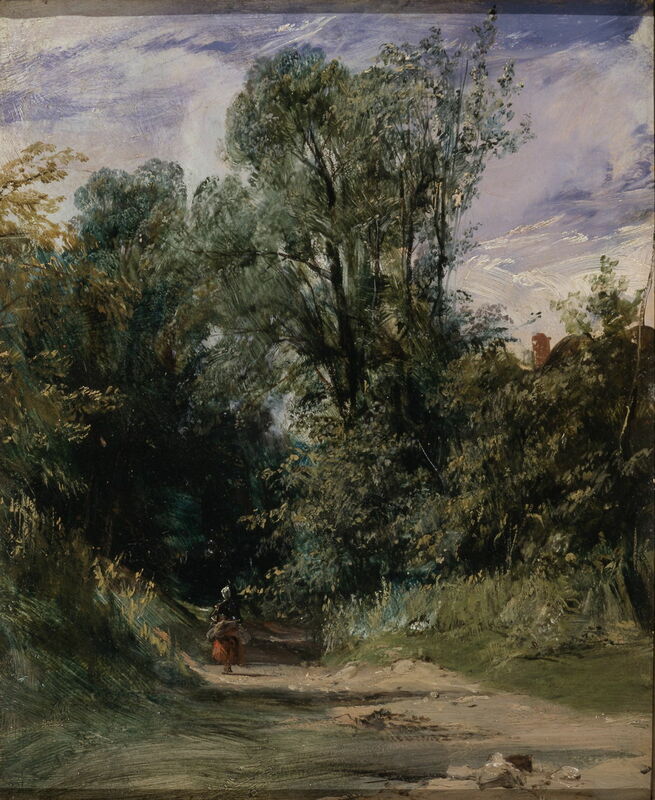 Richard Parkes Bonington (1802–1828), A Wooded Lane (c 1825) (193), oil on millboard, 28 x 22.8 cm, Yale Center for British Art, New Haven, CT. Wikimedia Commons. 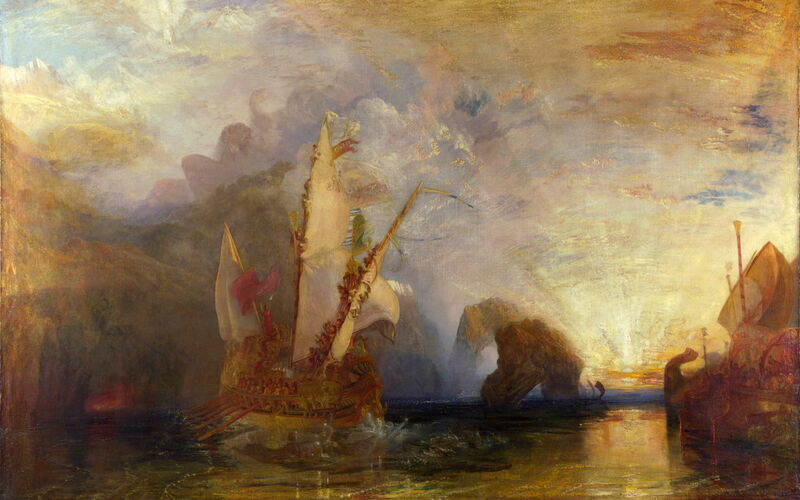 JMW Turner was undergoing the transition from his more traditional oil paintings to that more typical of his later years. In less than a decade of painting professionally, Bonington was amazingly prolific: Noon’s catalogue includes 400 watercolours and oil paintings, and there are undoubtedly many others which are still not known about or have been lost. Bonington had a direct influence on Delacroix, and thereby indirectly on the Impressionists and the major changes which happened over the course of the latter half of the 1800s. His use of colour and light, his painterly brushwork, his development of coastal landscapes in Normandy, and of riverbank scenes in the Île de Paris, were important groundwork for the Impressionists. Bonington’s scenes of the traditional fishing industry operating on beaches may even have influenced Eugène Boudin in his paintings on the Channel coast of France, and perhaps the much later watercolours of Winslow Homer at Cullercoats in England. It would seem to be a fruitful area for further work to examine Bonington’s influence. Noon P (2008) Richard Parkes Bonington, The Complete Paintings, Yale UP. ISBN 978 0 300 13421 6. Note that numbers given after the year of each painting in the captions refer to Noon’s catalogue. Posted in General, Painting and tagged Bonington, Boudin, Constable, Corot, Delacroix, Homer, oil painting, painting, Turner, watercolour. Bookmark the permalink.